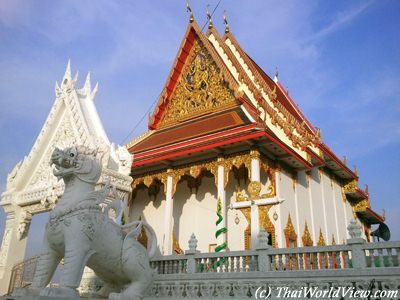 The New Year's Eve (วันสิ้นปี) and the 1st January (วันขื้นปีใหม่) are public holidays in Thailand. It is the occasion for religious and festive events. 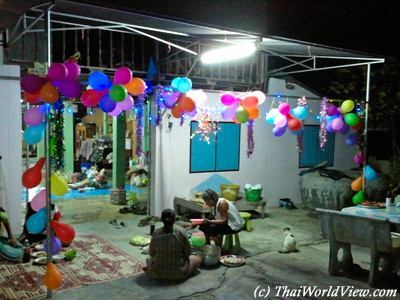 New Year Eve can be celebrated via many ways in Thailand. Some drink and party. Some choose a spiritual way. 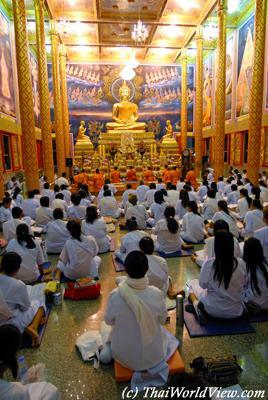 Some Buddhist temples organize sessions from 31 December afternoon to 01 January early morning to listen to monks' dharma speech. At 12.15AM there is even floating lanterns (ลอยโคมไฟ) launched into the sky to symbolize the bad sins of last year going away. The 3 days before and afer New Year's Eve are considered as Seven dangerous days. 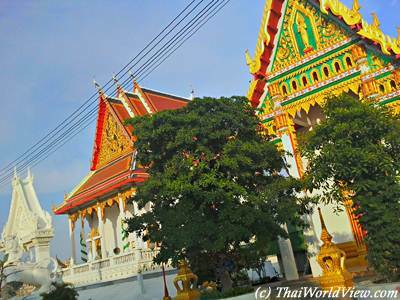 Many Thai people go back to their home in Thai provinces. Many people party and drink so it causes many casualties due alcohol abuses. 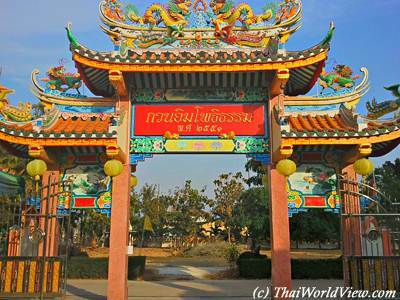 Most of the areas with dead are in Surin, Sri Saket, Khon Kaen and Chiang Mai. People are drunk and drive without helmet despite being a mandatory law. 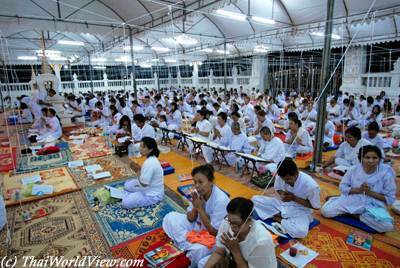 Thai people wear white clothes. No food is allowed during the long night. Only hot drinks such as cafe or ovaltine. 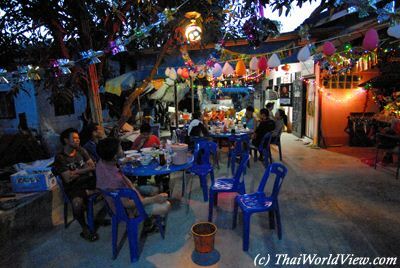 Many Thai people also organize evening feasts for New Year's Eve. 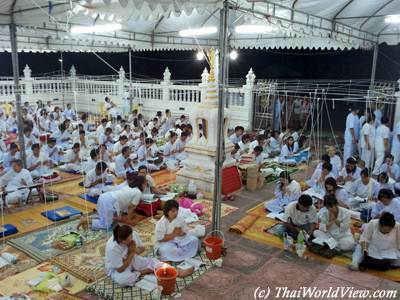 Often Thai people go from one feast to another. 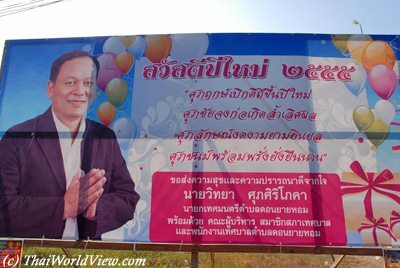 At midnight and during the following days, everybody greets each other with the saying "SAWATDEE PI MAI" (สวัสดีปีใหม่), i.e. Happy New Year! Most of the people arrive at nighttime but some already gather during the afternoon. 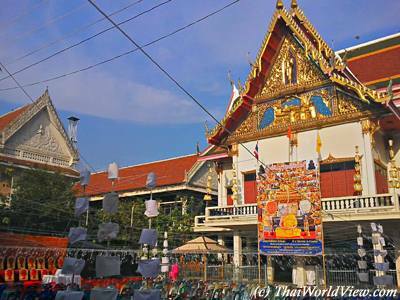 The ceremony called บวชชีพรามณ์ happens around the Buddhist temple's main chapel. One thousand people joined. 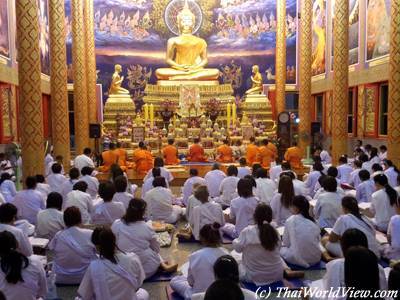 This ceremony is called Buat Chee Phram (บวชชีพรามณ์). People are wearing white clothes. 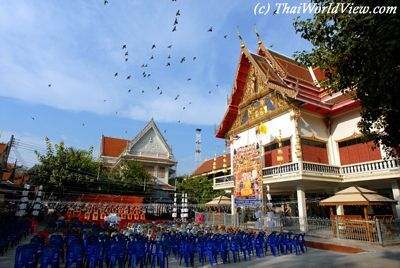 Buat Chee Phram (บวชชีพรามณ์) is an impressive event gathering hundreds of people around the Buddhist temple's main chapel. 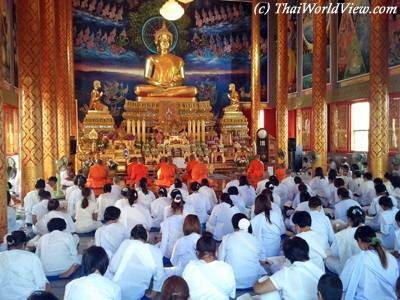 People get good deeds by such action (ได้บุญด้วย) and release inner strength (ได้ออกกำลัง). 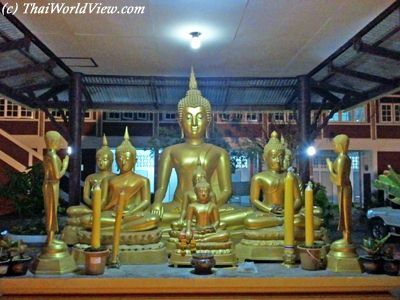 The Buddha statue is in the background, then the monks are praying in front of it. The laymen and laywomen are in the foreground. 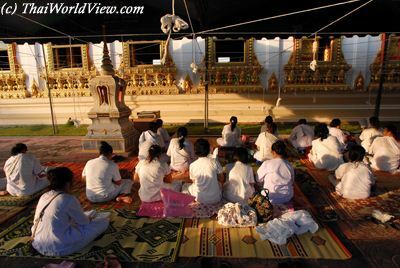 On New Year's Eve here in Wat Don Khanak and many other places in Thailand, local people come to listen to Buddhist prayers. 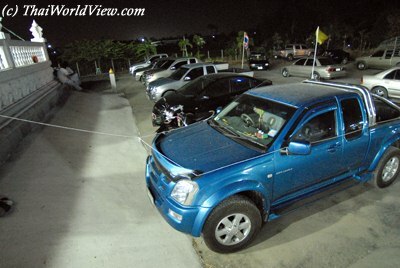 Some cars have even some sacred white threads linked to the Buddhist temple so that the cars can also receive some blessings and avoid accidents in the coming year. 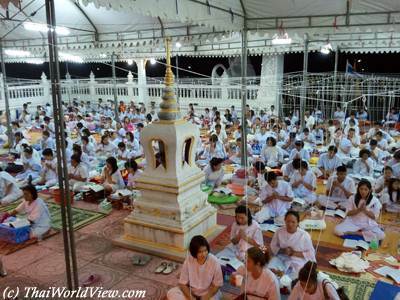 Other Buddhist temples organize lustral water bathing at midnight (กระถางน้ำมนต์). 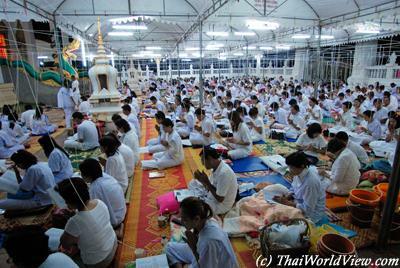 Thai people will arrive only around 11 PM to listen to monks' Dharma sermon. 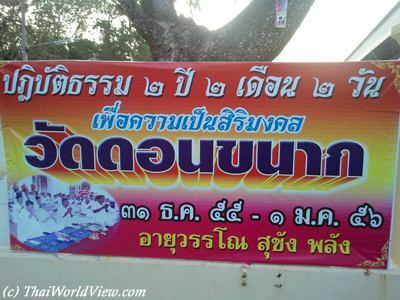 HAPPY NEW YEAR (สวัสดีปีใหม่) 2555 / 2012 from Nakhon Pathom. In every area, local district officers gives their New Year blessings through big advertisement panels. 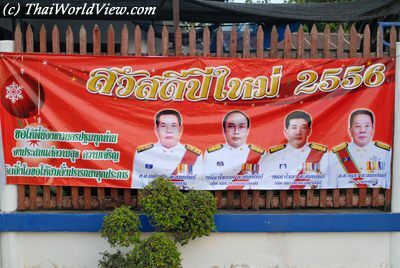 HAPPY NEW YEAR (สวัสดีปีใหม่) 2556 / 2013 from Nakhon Pathom. In every area, local district officers gives their New Year blessings through big advertisement panels. 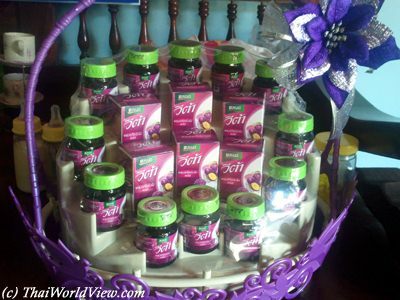 Typical gifts for New Year include bank notes and also healthy drinks such as chicken broth. 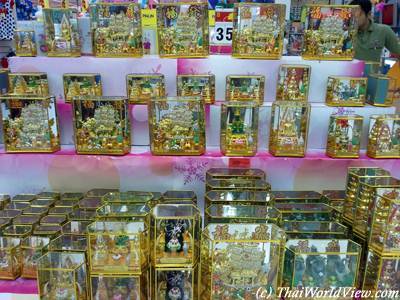 Other typical gifts offered for New Year best wishes are religious gifts. Big malls such as Big C offer an impressive choice. For New Year's eve, there is often family gathering and diner at home. Local small fireworks or firecrackers are launched by kids to celebrate the event. 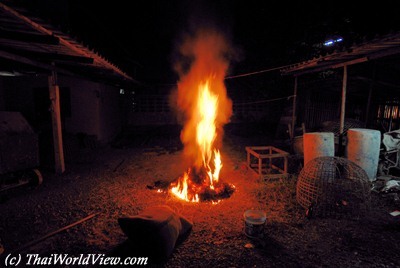 Barbecued pork (หมูกะทะ) is also prepared. Delicious and simple dishes are done in Thailand Central Plains villages. Steamed chicken is prepared thanks to a strong fire. New Year's Eve includes neighbours gathering and often features karaoke sessions. 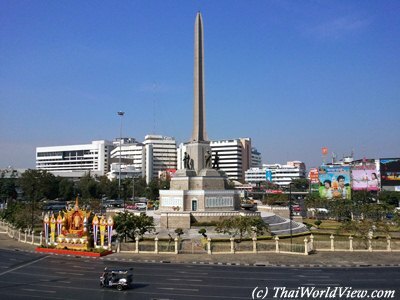 Empty streets along Victory monument on 01st January in Bangkok. Traffic jams are back now. HAPPY NEW YEAR (สวัสดีปีใหม่) 2556 / 2013 from Nakhon Pathom. 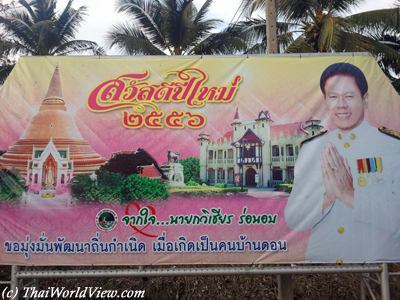 In every area, local district officers gives their New Year blessings through big advertisement banners.